"Cut in haste, U-turn at leisure" is a synthetic, perfect definition of modern British defence policy. After the obscene blunder of the SDSR 2010, that is more true than ever. 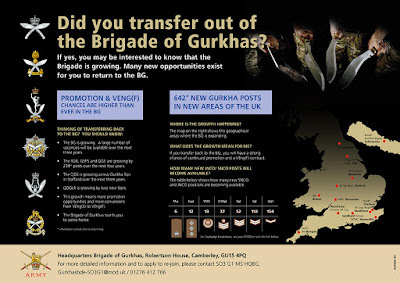 The latest U-turn relates to the Brigade of Gurkhas, which was sharply cut back as part of early Army 2020 phases and was several times described as a potential victim of disbandment. I've been saying for ages that, among the many good reasons to keep the Brigade of Gurkhas going, there is the simple fact that there never is a shortage of Gurkhas volunteering for service, making this formation invaluable for filling manpower gaps. And currently, even against the very low target of 82.000 regulars, the Army has a sizeable manpower gap and a recruitment and retention problem. Enter the U-turn on Gurkha cuts. The brigade (which was all but overmanned in 2010) finished to shred personell as mandated by 2010 cuts just last year, and now is being expanded by 642 new positions, going back, more or less, to pre-cuts liability levels. The brigade had more than 3000 posts until 2010, but that was cut down to the current low of 2612. The 642 new positions bring liability back to 3254. 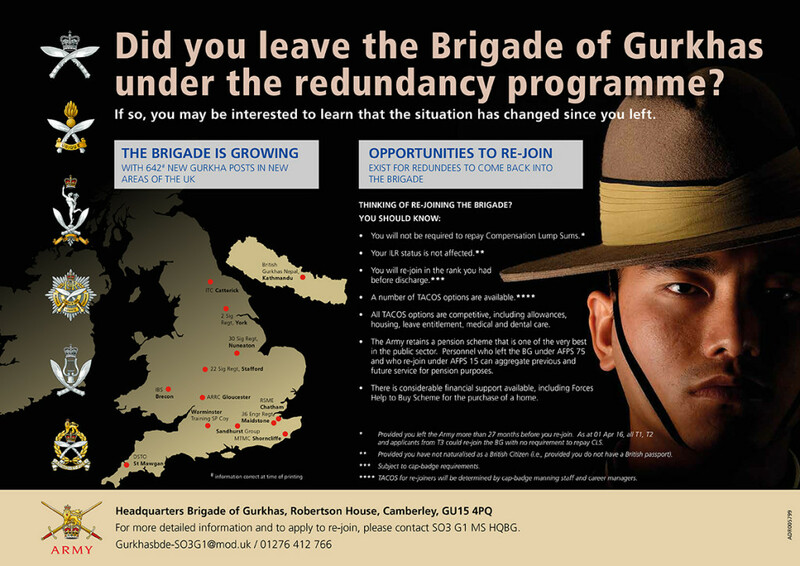 "Cheers for all your hard work making people redundant, Gurkha Brigade HQ. Now that you are done, call back everyone." The most "amusing" is the literal invite to those who have just been kicked out in the four tranches of redundancies to come back in their previous rank and without paying back the Compensation lump sums received. 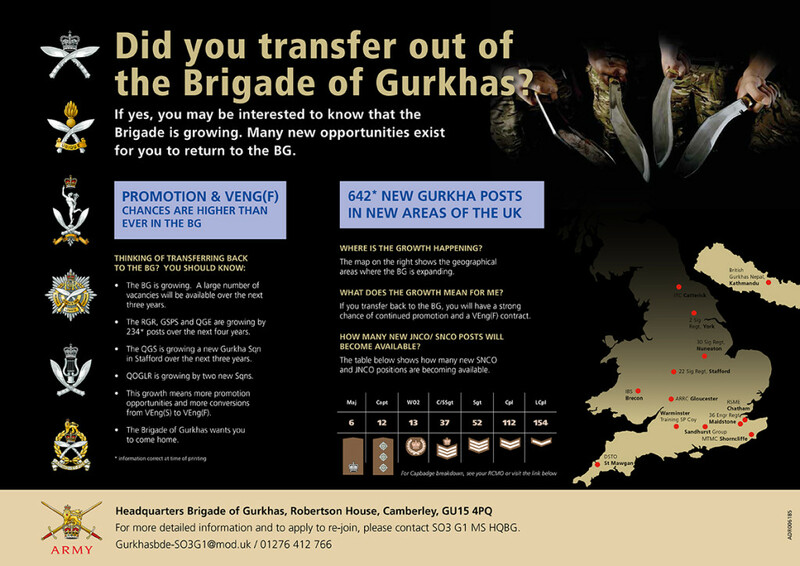 Headquarters Brigade of Gurkhas (HQBG) is now based at the Former Army Staff College, Camberly, Surrey and is responsible for providing advice on all matters relating to the recruiting and employment of Gurkhas in the British Army. It also helps coordinate welfare for retired Gurkhas in the UK. HQBG is not part of the operational chain of command and has no operational units directly under it, but it provides an important unifying element for the Brigade, its activities and its soldiers. Headquarters British Gurkhas Nepal (BGN) is situated in Jawalakhel, Patan, just south of the river from central Kathmandu. BGN co-ordinates Gurkha recruitment, provides local support to the soldier and ex-servicemen and maintains Disaster Relief preparedness within resources in order to support Firm Base activity in Nepal. Gurkha Staff and Personnel Support Company was formed on 30 Jun 2011. GSPS personnel were known as Gurkha Clerks before the inception of GSPS. Gurkha Company (Mandalay) is located in Brecon, Wales and provides support to the Infantry Battle School (INFBS). The INFBS conducts realistic battle training for officers who have passed out of Royal Military Academy Sandhurst and for Warrant Officers, SNCOs and JNCOs. Gurkha Company provides training support to the INFBS, enabling world class training for those undergoing courses at Brecon. Gurkha Company (Sittang) dates back to 1972 and is as an integral part of the Royal Military Academy Sandhusrt (RMAS). Sittang Company provides training support to the Academy, enabling world class training for the Army’s future leaders. Gurkha Company is located at the Infantry Training Centre in Catterick and is part of the 2nd Infantry Training Battalion. Its mission is to mould Nepalese youths into trained soldiers who will live up to the traditions of the Brigade of Gurkhas. The Band of the Brigade of Gurkhas was raised in Nov 1859 as part of an Indian Gurkha Regiment called the Sirmoor Rifle Regiment. It has 16 Bandsmen and one Naik (a leader and soon became a part of Regimental life, playing for parades, polo matches, dinners and troop entertainment at the Regimental base at Dehradun, North East of Delhi. In early days the Band travelled with the Regiment to other areas of India, Malta, Cyprus and Afghanistan. The Queen’s Own Gurkha Logistic Regiment also known as 10 The Queen’s Own Gurkha Logistic Regiment or 10 QOGLR is a regiment of the British Army. The regiment forms part of the Royal Logistics Corps and was created on 5 April 2001. The regiment was formed as a merger of The Queen’s Own Gurkha Transport Regiment, The Gurkha Transport Regiment and The Gurkha Army Service Corps; which were formed as component parts of The Brigade of Gurkhas on 1 July 1958. The Queen’s Gurkha Engineers (QGE). Gurkhas were first enlisted into the Royal Engineers in September 1948 when a Gurkha Training Squadron RE was formed. The British Officers were drawn from the Corps of Royal Engineers, 1st King George’s Own Bengal Sappers and Miners, 2nd Queen Victoria’s Own Madras Sappers and Miners, 3rd Royal Bombay Sappers and Miners and Gurkha Officers and Other Ranks were drawn from 2nd King Edward VII’s Own Goorkhas (The Sirmoor Rifles), 6th Queen Elizabeth’s Own Gurkha Rifles and 10th Princess Mary’s Own Gurkha Rifles. 1st Battalion The Royal Gurkha Rifles is a regiment of the British Army, forming part of the Brigade of Gurkhas. The Royal Gurkha Rifles are now the sole infantry regiment of the British Army Gurkhas. Like the other Gurkha regiments of the British and Indian armies, the regiment is recruited from Gurkhas, a term for people from Nepal, which is a nation independent of the United Kingdom and not a member of the Commonwealth. The regiment was formed in 1994 from the amalgamation of the four separate Gurkha regiments in the British Army. October 2015 deal with Sultanate renews partnership; 1st Gurkha Rifles to stay for “next five years”, suggesting a slow-down in unit rotations. 2nd Battalion The Royal Gurkha Rifles (RGR) is a regiment of the British Army, forming part of the Brigade of Gurkhas. 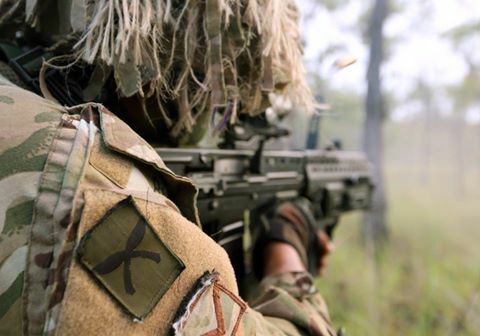 The Royal Gurkha Rifles are now the sole infantry regiment of the British Army Gurkhas. Like the other Gurkha regiments of the British and Indian armies, the regiment is recruited from Gurkhas, a term for people from Nepal, which is a nation independent of the United Kingdom and not a member of the Commonwealth. The regiment was formed in 1994 from the amalgamation of the four separate Gurkha regiments in the British Army. Under Army 2020 it was due to be part of 11 Infantry Brigade but, in another U-turn, it was assigned to 16 Air Assault brigade when it became evident that just 2 PARA battalions were not enough (another very obvious thing which somehow had to be "discovered"). Repeatedly through the history of the british army, sub-units of Gurkhas have been formed and disdanded to fill manpower gaps in other regiments. Until recently, there was a Gurkha formation of engineers within 24 Commando Engineer Regiment, for example. We will undoubtedly see more of this in the future, too. A few gurkha engineers and logisticians who left the army under the redundancy tranches transferred into the Royal Navy, and i've been wondering for months now on whether the Royal Navy could / should open up its own recruitment unit in Nepal, to bring in some much needed manpower. 234 new positions will be added to Royal Gurkha Rifles, Gurkha Staff and Personnel Support and Gurkha Engineers over the next 3 years. 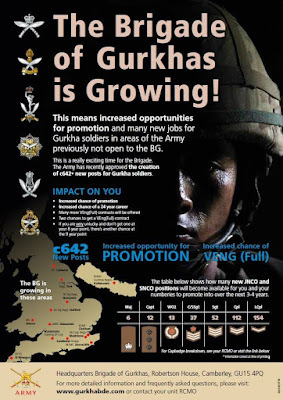 A new squadron of Gurkhas will be formed within the Royal Signals within the next three years, which is very good news because the army has a massive, massive shortage of Signals resources as i've detailed on these pages in many occasions. The Gurkha Logistic Regiment will expand by 2 new squadrons, which is good news because logistics are another area badly hit by Army 2020 cuts, and the regiment is currently pretty weak, with just two squadrons plus HQ and an establishment of 471, with a concept of operation based on the assumption that lots of local contractors would be hired in theatre to fill the gaps. The Gurkha brigade remains a very precious element within the Army, and an invaluable reserve of loyal volunteers. Well, that is very good news. The Gurkhas are fine troops and, as you have pointed out more than once, they are readily available. The U-turn will go a good way to making up the shortfall of manpower in Signals and Logistics, something else you have repeatedly pointed out. Let’s have more of ‘em! Incidentally, I read some time ago about a possible plan to introduce a Sikh regiment (into the Reserve, I think). There are, it is believed, plenty of volunteers. I’m pretty sure the report stated that General Sir Nick Carter had said that the Army was looking into the matter but I have heard nothing more about it. Probably killed stone dead by political correctness before it had chance to get off the ground! Yes I read that too and was excited by it. Probably killed for the reason you state, PC madness. As for the Gurkhas, would love to see them formed as a proper Brigade and added to 3RMCdo and 16AA as our rapid reaction light division. Would need several other British manned squadrons to form to plug the holes left in other units as the sub units Gabriele listed concentrate, and maybe a new Gurkha artillery regiment, REME, medical and all the bits and pieces. The Gurhkhas are certainly first-rate soldiers but given our recent limited resources and funding, I think that to form a specialist Brigade along the lines you suggest (for rapid reaction) might detract from other areas of the the Army. They are already a Brigade organisationally, of course (The Brigade of Gurkhas)but you mean organized as a fighting formation. I'd be interested to hear Gabriele's view on the subject, though. It is probably wiser to keep them more mixed into the wider force, rather than necessarily have them standing on their own, if you ask me. What matters is the contribute they can give across the army. Perhaps post Brexit, expansion of the Gurkhas could be part of the new UK global engagement, with a possible expansion of the BFB in Brunei in what is now a critical area of the world.